The lab, completed fall semester 2006 and approximately 800 square feet, operates under the direction of Dr. Paul Knapp. Lab facilities include three use-specific rooms dedicated to wood-sample preparation, crossdating, and measurement. The Regolith Analysis Laboratory provides for the use of physical and chemical procedures in determining the mineralogical, textural, and structural characteristics of natural bodies consisting of loose materials at the earth’s surface (i.e., regolith). Studies of regolith are useful for research in geomorphology, hydrology, and other disciplines requiring an understanding of earth surface processes. 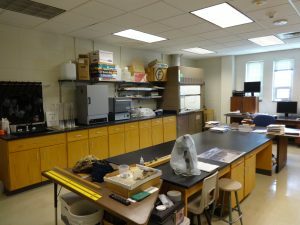 The lab is equipped with a chemical fume hood, drying oven, muffle furnace, refrigerator, a variety of glassware and other basic labware useful for sediment and soil characterization, filtration pump, petrographic and reflected-light microscopes, and computers. The lab also contains an array of precision instruments for studying the magnetic properties of earth materials. The Regolith Analysis Lab is under the direction of Dr. Dan Royall.